Wilbur Kurtz was a Georgia artist, historian, illustrator and writer born in Oakland, IL. He became a foremost authority on Old South Atlanta. He studied at DePauw University, Art Institute of Chicago, and with George Wilmer Browne. He lived in Atlanta, Georgia where he contributed articles and illustrations to Atlanta Constitution, Atlanta Journal. He founded the Pen and Brush Club of Atlanta and cofounder of the Atlanta Civil War Round Table. Kurtz was an honorary member of Atlanta Historical Society, a member of the Atlanta Symposium, and Atlanta Artists Association. His work is at Georgia’s Executive Center; the Woodrow Wilson Shrine at Staunton, VA; five murals in the National Bank of Abbeville, SC; a large proscenium arch decoration-in collaboration with Don Dubois-for the Macon, GA City Auditorium; six large murals for the Georgia exhibit at A Century of Progress Exposition, Chicago; a series of paintings of buildings which housed the Coca-Cola Company, Atlanta; the Coca-Cola Bottling Companies in Houston, TX and Atlanta, GA; Atlanta Women’s Club, Clark Howell School; Federal Reserve Bank; Atlanta Historical Society; Atlanta Chamber of Commerce; governors Mansion(mural), First Federal Savings and Loan, Piedmont Driving Club, advisor for the restoration of the Cyclorama, the Battle of Atlanta, at Grant Park. He was the artistic adviser and historian for “Gone with the Wind” (1939), hand selected by Margaret Mitchell; “Song of the South” (1946); and “The Great Locomotive Chase” (1957). After his first wife, Annie Laurie’s death, Kurtz married Annie Rachel Pye (1895-1985) of Woodland, Georgia, in 1949. Markings Inscribed on reverse "Miss M.P.L. Springdale Park, Inman Park, Atlanta, GA May 1915"
Comments Inscribed on reverse "Miss M.P.L. 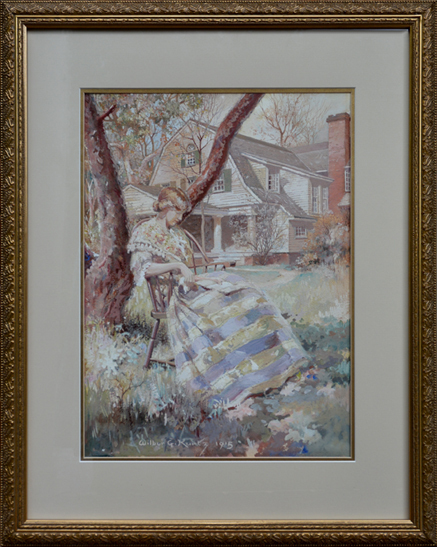 Springdale Park, Inman Park, Atlanta, GA May 1915" This painting is in excellent condition, beautifully framed, matted and under glass, also in excellent condition.